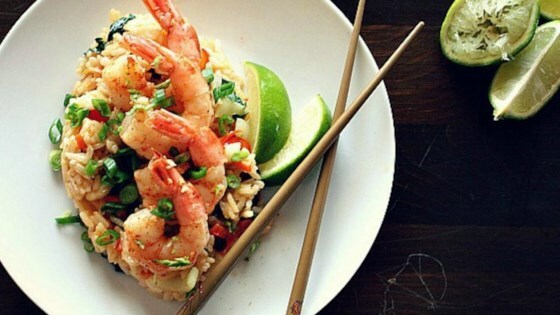 "Coconut, lime, and chile flavors tie this shrimp dish together wonderfully. So many awesome flavors, and each one can easily be distinguished! Nothing overpowers the other. I served my shrimp on a bed of spicy peanut rice with bok choy and have provided that recipe as well, in case you were interested." Bring water and rice to a boil in a saucepan. Reduce heat to medium-low, cover, and simmer until rice is tender and water has been absorbed, 20 to 25 minutes. Melt coconut oil in a skillet over high heat while rice cooks. Squeeze juice of 1 lime into the skillet. Add shrimp and cook for 1 minute. Sprinkle some chile powder over the shrimp. Flip shrimp and cook for 25 seconds more. Transfer shrimp to a container. Sprinkle with more chile powder and a bit more lime juice. Cover and toss. Keep covered to keep warm. Reheat skillet over medium-high heat. Toss in bok choy, carrot, red bell pepper, and scallion. Stir in peanut butter and sriracha sauce; cook for 1 minute. Add cooked rice. Toss well to ensure that everything is coated evenly. Spoon rice onto a plate and place shrimp on top. Squeeze juice of the second lime over the finished plates. Zest 1 lime over the shrimp.